Who Is This Guy on the Greyjoy Ship in the 'Game of Thrones' Trailer? Who Is This Guy on the Greyjoy Ship in the ‘Game of Thrones’ Trailer? We’re a little over a month away from the eighth and final season of “Game of Thrones,” and we just got our first real trailer for the upcoming season. Those hoping to glean some major insight into what’s going to go down this season will come away disappointed because this carefully assembled trailer avoids anything that appears to be a major spoiler. It’s just lots of shots of nearly every surviving major character, and some hype shots of folks getting ready to do battle with the Night King and his Army of the Dead. So there’s not much here in the way of new information — or at least not that we can tell until we see the context. But the trailer does appear to introduce us to at least one new “Game of Thrones” character. We just aren’t sure who it is yet. The person in question you can see in the header image above. At first glance, we thought that was probably Jaime Lannister, until we remembered that Jaime doesn’t do his hair that way anymore, and also noticed this guy doesn’t have a gold hand. And he’s carrying a sword that doesn’t look like the one Jaime wields. So we’re left to speculate. The most logical guesses would be Euron Greyjoy or Theon Greyjoy, but it’s not either of them. So who else might be sporting that hairstyle and hanging out on a Greyjoy ship? There’s no logical answer among the characters we already know. But there is a logical guess we can make based on the other people on that ship and something Cersei mentioned at the end of Season 7. 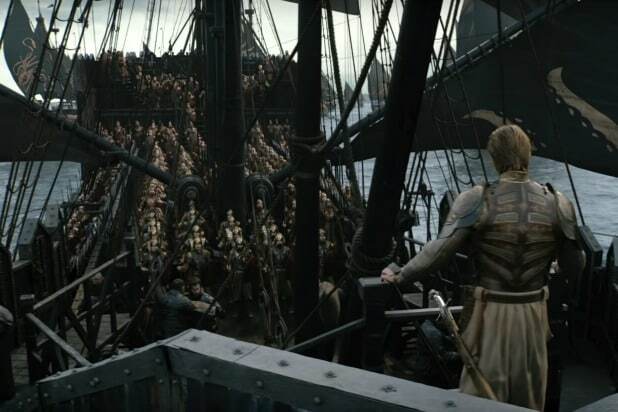 Aside from the guy who looks an awful lot like Jaime did in earlier seasons of “Game of Thrones,” the most notable aspect of that shot is what the soldiers on the ship are wearing — golden helmets that are unlike any we’ve seen previously on the show. Which reminds us that at the end of last season Cersei mentioned to Jaime that Euron was heading back to Essos to hire the mercenary Golden Company to fight for the Lannisters in whatever war they were about to get involved in. So it makes sense that what we’re looking at here is a Greyjoy ship ferrying members of the Golden Company across the Narrow Sea back to Westeros. This does not tell us whether that guy in the front of the ship is going to be a new major character, but it’s safe to assume that he’s a Golden Company leader. And to find out anything more about this we’re likely just going to have to wait until the final season of “Game of Thrones” actually airs beginning on April 14.